On Tuesday, July 10th., 2018 Pooler Fire-Rescue was dispatched at 1545 hrs. to Pooler Parkway and Merlot Lane for an Auto Rescue assignment. Dispatched advised of a two vehicle collision with one vehicle overturned with occupants inside and a second vehicle into a ditch with possible fire involvement. Engine Co. 61, Engine Co. 64 and Truck Co. 61 responded with back-up from Chief 60, Deputy 61, Assistant 62 and Safety 60. Engine Company 61 arrived first on scene with two vehicles involved, one overturned on its driver side in the Northbound lane of Pooler Parkway and the second vehicle into a ditch. Upon investigation, it was found that there were two patients in the overturned vehicle and one patient from the upright vehicle. Chief 60 arrived behind the first arriving engine crew and assumed Incident Command. Engine Co. 64 and Truck Co. 61 arrived on scene and began setting up for extrication of two patients from the overturned vehicle. Paramedic units arrived from Chatham Emergency Services and confirmed that one patient in the overturned vehicle had received fatal injuries on impact. Crews worked to extricate the driver by performing a roof removal operation. The driver was extricated in under 10 minutes and given to the care of on scene paramedics but unfortunately succumbed to injuries received from the force of impact. Northbound Pooler Parkway, between Memorial Blvd. and Pine Barren Rd. remained closed until approximately 1930 hrs. as crews from Pooler Police and Georgia State Patrol investigated the crash. At approximately 2302 hrs. on Sunday, July 8th., 2018, Communications dispatched Pooler Fire-Rescue to a report of a building fire at 160 Pooler Parkway, at the Walmart. 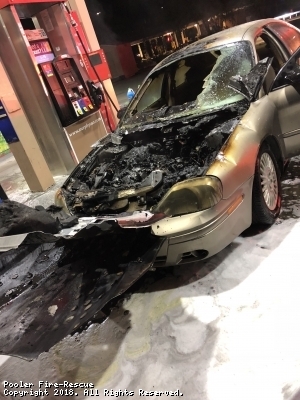 The assignment was quickly updated for a vehicle fire that was near a fuel pump. Engine Company No. 62 and Truck Company No. 61 made the response. Engine Co. 62 arrived on scene at 120 Pooler Parkway at the Murphy USA gas station and had a single four door sedan with heavy fire involvment in the engine compartment and in the passenger compartment. The vehicle was approximately 3 feet away from the fuel pump. AOIC J. Howell and Probationary FF. S. Zealey stretched the bumper line and made a quick knock down of the fire, preventing any forward fire spread. Truck Co. 61 crew assisted with overhaul operations before returning to available status. All occupants of the vehicle made it out without injury. Engine Co. 62 crew remained on scene for approximately one hour, extinguishing all hot spots and clearing away debris once the vehicle was removed by the tow company. On Friday, June 22, 2018, the members of the City of Pooler Department of Fire-Rescue officially welcomed the last member of Recruit Class 18-01, Probationary Firefighter Beel. The Department graduated 3 other Probationary Firefighters from Recruit Class 18-01 on April 20th., but Beel was unable to graduate with his classmates due to a minor injury he had received. 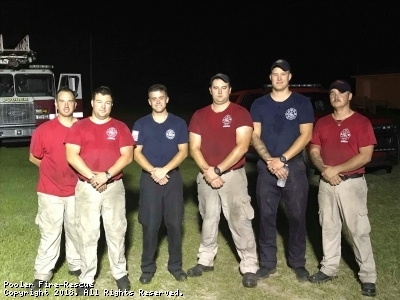 After being cleared from his physician to return to duty, Recruit Firefighter Beel spent a few weeks finishing the required training topics and graduated on June 22nd. and was assigned to Engine Company 62 ("C" Shift) under the leadership of Lt. Rodriguez. We wish Probationary Firefighter Beel a long and safe career with the City of Pooler Department of Fire-Rescue. On Wednesday, May 2, 2018 at 1129 hrs., Port Wentworth Fire Department was dispatched to the area of State Highway 21 and Gulfstream Road for a report of a plane crash in the area. While units were responding, Metro Communications began updating of multiple calls of a large plane down in the middle of the highway with heavy flames and smoke visible. Engine Company 42 of the Port Wentworth Fire Department arrived on scene and confirmed of a large aircraft down, blocking all lanes of travel of State Highway 21, with heavy fire involvement and a large debris zone. Engine Co. 42 advised they would be establishing a working perimeter and securing a "hot zone" and "cold zone". Chief 60, Assistant 62, Engine Company 62 and Water-Tender 62 responded from Pooler Fire-Rescue at 1133 hrs. Chief 60 (W. Simmons) arrived on scene at 1140 hrs. and assumed Incident Command of the scene until Chief 40 (Port Wentworth) arrived, which at that time, Chief 60 assumed Operations. Multiple agencies from the local, state and federal level responded. Chatham County Emergency Management Agency responded and established the Incident Command Post. Local firefighters worked with airport firefighters to secure the scene and extinguish the flames to establish a safe scene for federal agencies to begin their investigation. It was soon confirmed into the incident that it was in fact a military C-130 Hercules of the Puerto Rico Air National Guard that had crashed. Multiple tenders were requested to scene and all local fire and ems crews worked well into the night until the scene was officially deemed safe for federal agencies to move in to begin their investigation. Water-Tender 62 cleared the scene at 1803 hrs. 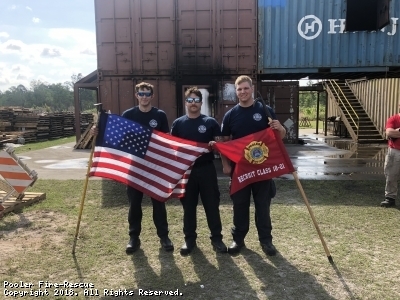 Engine Co. 62 cleared at 2008 hrs. and Chief 60 cleared just after 2100 hrs. Sadly, it was confirmed by official investigating personnel that all 9 airmen who were on board, perished in the crash. We send our deepest condolences to the families and the members of the Air National Guard of Puerto Rico during this tragedy. As expected with such an incident like this, investigating agencies will have that area secured and closed down for an extended period of time as a full and thorough investigation is conducted. After a 20 week recruit training program, on Friday, April 20th., 2018, the City of Pooler Department of Fire-Rescue graduated three new Probationary Firefighters into the department. During the 20 week program, the recruits of Class 18-01 received their EMT-B national registry, Pro-Board Firefighter Level I and II, Hazmat Awareness and Operations along with a few other certifications. We would like to officially congratulate Probationary Firefighters of Recruit Class 18-01 Derek Cronsell, Jake Woznewski and Sean Zealy. We wish you all a happy, safe and long career with Pooler Fire-Rescue. Early Saturday morning, on April 21, 2018, at approximately 0045 hrs., Garden City Fire-Rescue and Pooler Fire-Rescue were dispatched to the 100 block of Smith Avenue for a reported residential house fire. Engine Company 21, Engine Company 22 (Garden City) and Engine Company 63 and Truck Company 61 (Pooler) responded. Engine Co. 21 was the first unit on scene and reported a one story, single family dwelling with smoke visible from the Alpha-Side and established incident command. Before the engine crew could make entry, the crew was met with an unresponsive minor being brought to them. Command immedetly requested Chatham EMS to the scene. Once Engine Co. 22 arrived on scene, they took over patient care as the crew from Engine Co. 21 returned to stretch an 1.75" attack line to begin interior operations. The interior crew located a rear bedroom heavily involved in fire and began a quick knock down. Pooler Fire-Rescue Engine Co. 63 and Truck Co. 61 arrived simultaneously. Engine Co. 63 crew advanced a secondary back up line off Engine Co. 21 while the crew from Truck Co. 61 made entry into the house and began a primary search of the dwelling. Once the primary search was proven negative, the 4 man crew began overhaul operations, opening up walls and ceilings for the interior engine crew, checking for any forward fire extension. With the fire contained to the room of origin, and the crew from Engine Co. 21 having all visible fire extinguished, the Truck crew began horizontal ventilation by removing windows and then removing debris from the fire room. While the crew from E21 and T61 worked interior, E63 stood by as the active RIT crew while the E22 crew was able to get the patient in a stable condition as care was transferred to Chathem EMS medics on scene. The patient was immediately transported to an area trauma center. An additional ALS unit was requested to the scene for a second patient with burns to the hands. Both crews from Garden City and Pooler worked together making an aggressive but tactical stop and extinguishment of this house fire. The cause of the fire is under investigation. Pooler Fire-Rescue operated for approximately an hour and a half before returning to available status.